The iconic cartoon character Popeye became most famous for his slapstick routine of eating a can of spinach, then attaining superpowers that he often used to give his gigantic nemesis Bluto a severe pummeling. But Bluto might be lucky that Popeye never got his hands on a glass of beet juice. A small study from scientists at the Washington University School of Medicine shows that the humble red root vegetable – perhaps best known for its high beta carotene concentrations – contains a molecule that boosts muscle power. The researchers gave nine subjects with heart failure a small serving – 140 milliliters, or about 2/3 of a cup – of concentrated beet juice. Almost immediately after drinking it, the study participants saw an increase in muscle power of 13 percent on average. The findings appeared in September in the journal Circulation: Heart Failure. That's a dramatic boost, on par with the sort of improvement a person can expect after two to three months of resistance training, says Andrew Coggan, a study coauthor and assistant professor of radiology at Washington University. The study looked specifically at the muscles that extend the knee. Also, it included only patients with heart failure since their muscles don't deliver as much power. That can make it easier to measure improvement in them, the scientists say. But the muscle power benefits of beet juice can be enjoyed by others, too. Coggan and coauthor Linda Peterson have done two additional studies, one that focused on 12 healthy individuals recently published in the journal Nitric Oxide, and another recently submitted for publication that looked at 13 trained collegiate athletes. All groups saw marked improvements in muscle power after consuming beet juice, the researchers say. And by power, says Coggan, they mean a combination of force and velocity – essential for sports like gymnastics or sprinting, and even household tasks like moving a piece of furniture or simply getting up from a reclining chair. "And we're seeing these improvements within about an hour and a half to two hours after ingestion," says Peterson. "It's pretty dramatic." What makes beets a power booster, Peterson explains, is nitrate, an ion found in high densities in leafy greens – like spinach – and in beets. When nitrate is ingested, bacteria on the tongue convert it into nitrite, which then becomes nitric oxide. This molecule, Peterson explains, can have the effect of increasing muscle power. Other researchers have also documented performance-enhancing powers in beets. A study published in August 2013 in the Journal of Applied Physiology reported that consuming beet juice or other foods high in nitric oxide may improve or enhance circulation in young adults. But don't jump up and buy a juicer just yet, because not all research tells quite the same story. A study published last year in the journal Applied Physiology, Nutrition, and Metabolism looked at whether nitrate can enhance the blood flow to activated muscles. The authors found that a small helping of concentrated beet juice – the same product in the same quantity used in Peterson and Coggan's research – did not improve flow of blood to exercising muscles in the forearm. Coauthor David Proctor, a professor of kinesiology and physiology at Penn State's Noll Laboratory, says his research is far from conclusive. It tested a very narrow range of criteria, he says, and leaves many questions to be answered. He also adds that his results do not contradict what Coggan and Peterson saw. "If we had pushed our subjects up to higher workloads or perhaps had them do lower body exercise at higher intensities, I wouldn't be surprised if we had seen an effect [on enhanced blood flow to the muscles]," Proctor tells The Salt. He says his next study will look at the effects of beet juice on people with peripheral artery disease, which affects about 20 percent of adults older than 70 in the U.S. and significantly limits blood flow to muscles. Proctor speculates that a dietary supplement of beet juice could help patients with PAD with basic movements like walking and standing (the way dark chocolate does). 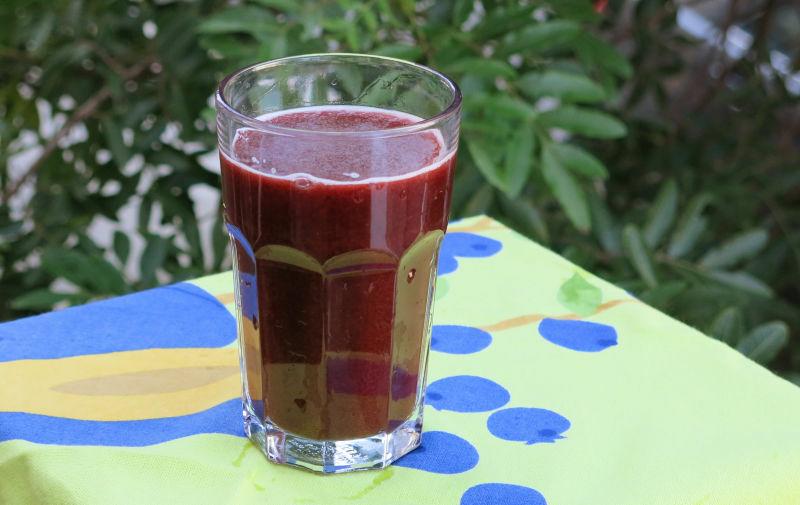 When it comes to sports, one thing that did happen in Proctor's study is the beet juice seemed to cause the smooth muscle walls of arteries in participants to relax. This is an effect, he says, that could make it easier for a person's heart to pump blood — though not necessarily allow the heart to pump more blood. Still, this could be a potential gain for athletes, though they may not benefit as much as people with PAD who have trouble walking. While Coggan and Peterson's study was the first to look specifically at how nitrate-rich beet juice affects muscle power, scientists have been studying nitric oxide's effects on the body since the 1990s. Partly as a result of such research, beet juice has gained a reputation among athletes like professional runner Ryan Hall and nutrition coach Allen Lim who has worked with some of the world's best cyclists. Today numerous companies are marketing beet juice-based products as sports drinks. A bottled liquid shot called Beet It, for example, was used in the studies by Peterson and Coggan and by Proctor. Coggan and Peterson's research shows that the most dramatic power boosts to be gained from beet juice occur in people with existing muscle dysfunction. However, their athlete-focused study found that even collegiate athletes sprinting on a stationary bicycle experienced a power boost of about six percent. "It's a small effect, to be sure, if you're an athlete," Coggan says. "But the difference between not making the podium at the Olympics and standing on the top step is often only a couple percent."